• The Master Visa Service helps expedite your U.S. passport within 24 hours, and the required visa for international travel. • Sort Out My Visa helps people get a visa for Australia or New Zealand. • Brit Education & Travel helps Russian speaking businesses meet their UK counterparts, and specializes in helping individuals receive a British private education. • Free Movement of Persons, Asylum, and Immigration – Explains visas, immigration, and asylum for citizens of the EU, and for non-citizens. • Emigra - Specializes in the Hong Kong immigration process and international business and employment visas. • VisaTrain helps people get working holiday visas to New Zealand and Australia. • IATA – Passport, visa, and health requirements, as well as customs, airport tax and currency information. • Malaysia’s Immigration Law, and information about visiting. • The Brazilian Consulate in Chicago can help groups or individuals traveling to Brazil get their business, tourist and cultural passport visas. • Moldova-Visa.com helps to secure visas to Moldova for citizens of the UK, U.S.A., and Canada. • Get help in obtaining your Vietnamese visa from My Vietnam Visa. • Australia Visa Application processes permanent or temporary visa applications for Australia and New Zealand for citizens of the US and Canada. • Belgium Visa Service helps people obtain a visa. • To get affordable immigration, visas, and relocation services for places such as New Zealand, the U.S.A., and Australia, go to Prime Visa Solutions. • Project Visa has worldwide visa and embassy information. • U.S. passport and visa help can be found at Travel Visa Pro. • The Consular Directorate of the Singapore Ministry of Foreign Affairs provides information about passports for citizens of Singapore, and gives helpful information to foreigners planning on going to Singapore. • Visa Connection gives U.S. citizens help with their passport and visa. • Services Consulares specializes in helping U.S. citizens get visas to Venezuela. 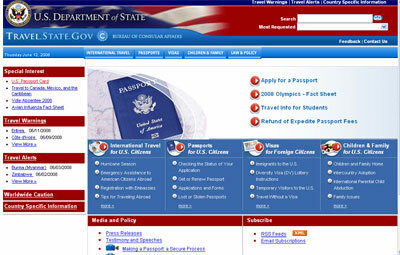 • For a complete database of all visa requirements, go to VisaHQ.com. • Visas and Passports will help you with your visa and passport processing. • Brazil Visas will help you get crucial documents needed to travel. Its focuses on solving visa problems.